It was suggested to us while we were in England that we should try this traditional English dessert: banoffee pie (banana and toffee). I pulled the recipe from here, and this was the result. This particular recipe uses a great method for making the toffee. 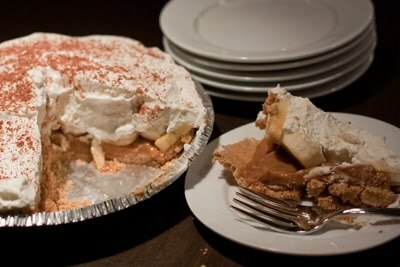 The pie was rich but delicious. It passed the ultimate test; my dad liked it!